B.J. JANSEN [bari] presents a bop date that goes down smoothly on COMMON GROUND [Ronin Jazz 20170501]. This sextet [Delfeayo Marsalis-tbn, Duane Eubanks-tpt. Ralph Peterson-drm, Dezron Douglas-b, Zaccai Curtis-p] recording moves along nicely [8/9&10/16]. 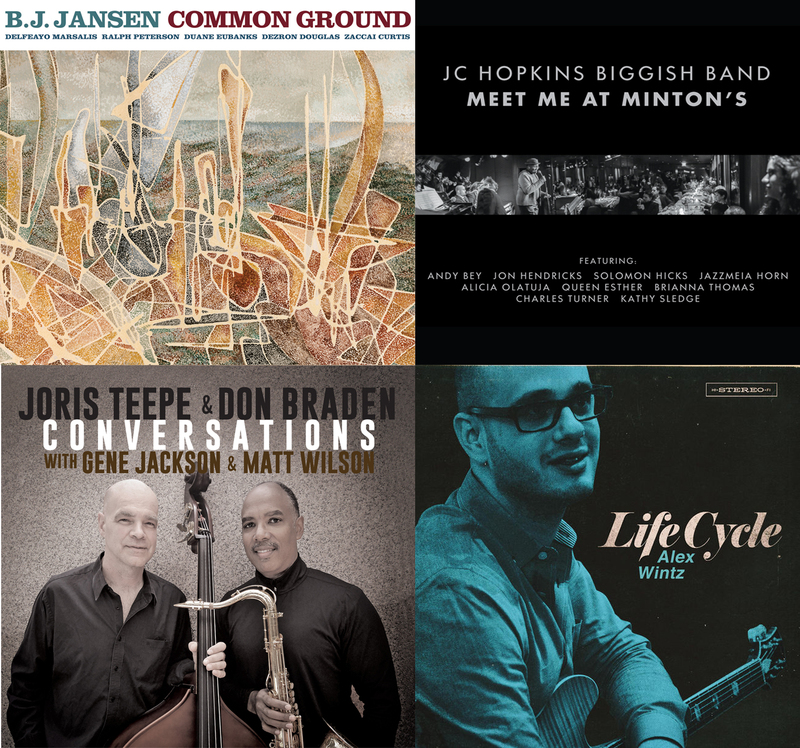 The compositions [9 tunes plus 3 alternate takes – 64:42] are mostly Jansen originals and the inclusion of 3 alternate takes is a good use of some 15 minutes and reacquaints the listener with some of the compositions. Jansen’s composition “Stacey’s Pace” is the most memorable on this recording. The sextet sounds like a working group but, I believe, was put together for the session. JORIS TEEPE [b] & DON BRADEN [ts/flt] have issued the aptly titled CONVERSATIONS [Creative Perspective Music Studio cpm3004]. These two have been working on and off since 1992. On these recordings from 2/09 to 4/16 they are joined by either Gene Jackson or Matt Wilson on drums for some of a program [61:11] of 7 fairly established tunes [3 Card Molly, Goodbye Porkpie Hat, Footprints, etc] plus 3 originals. This is very much a conversation between equals, with or without drums. There are times when the drummer is in the conversations at which times Teepe is either playing with or in counterpoint to others. The only down side for me comes on Matt Wilson’s “Stolen Time” where Braden plays flute, here the conversation falters a bit, however flute aficionados may feel differently. Good eavesdropping. ALEX WINTZ [gtr] makes his recording leadership date [1/3&4/16] on LIFE CYCLE [Culture Shock Records 888295542210]. Wintz is joined by Lucas Pino [s], Victor Gould [p] Jimmy MacBride [drm] and Dave Baron or Ben Williams [b] for a mix of 2 standards and 7 originals [56:26]. A pleasant date with Wintz showing touches ranging from Jimmy Raney to Wes Montgomery. Fleet fingers also show some thoughtful picking on “I Don’t Stand A Ghost of a Chance With You” with just bass and brushes. In tempo or out Wintz plays it fairly conservatively. With tracks as long as 8 minutes there was time to take some chances and if he had, this might have produced a more compelling debut. It is about playing and saying. JC HOPKINS [p] and his biggish band [16 pieces] are the feature on MEET ME AT MINTON’S [Harlem Jazz Records 888295 458023]. This is a first class band and has the feel of a NYC territory band circa 1955. The emphasis on this undated but very hip CD is on vocalists as there is a vocal on each of the 13 cuts [52:35]. The singers appearing are: Andy Bey, Jon Hendricks, Solomon Hicks, Jazzmeia Horn, Alicia Olatuja, Queen Esther, Brianna Thomas, Charles Turner and Kathy Sledge. There are many highlights here but for me of special note is Andy Bey on “Reflections”, complimented by a lovely Clare Daly baritone sax solo. Well worth your time and effort and resources.